Between 31 August and 9 November 1888, five brutal, very similar murders of prostitutes took place in Whitechapel, London: Polly Nichols (31 August); Annie Chapman (8 September); Catherine Eddowes and Elizabeth Stride (the ‘double event’, 30 September) and Mary Jane Kelly (9 November). During that autumn, sales of London newspapers rocketed, with the Star, the most popular, selling up to 300,000 copies a day. The similarities between the murders – all the victims were prostitutes whose throats were cut – provided a field day for the press. Newspapers played a vital role in creating the myth around ‘Jack the Ripper’ and amplified his terror. There was more potential than normal for speculation and sensationalism in the case of the Whitechapel murders as there were no witnesses, the police could uncover no clues or motives and no serious suspects were found. Part of the reason newspaper sales rocketed was because the press used the Whitechapel cases to stoke the public’s fear of ‘outcast London’. Whitechapel had come to symbolise London’s criminal underworld, providing a ready backdrop for any sensational newspaper report. The vibrant Whitechapel Road contrasted with the dark streets that branched off it, most notably Flower Street and Dean Street, which contained 27 courts, alleys and lanes and was one of the last remaining rookeries (slums) in London. Even 40 years earlier, in his seminal work London Labour and the London Poor (1840), the journalist Henry Mayhew conjured up a menacing vision of Whitechapel as ‘a suspicious, unhealthy locality’. He thought its inhabitants a ‘strange amalgamation of Jews, French, Germans and other antagonistic elements’ – bestial people who needed to be kept in check lest they erupt into anarchy. It is hardly surprising, therefore, that when the Whitechapel murders took place the press conjured up the spectre of the criminal East End. The style and readership class of a newspaper also influenced its political analysis of the Whitechapel murders. Towards the end of 1888, after several brutal killings had been committed and the perpetrator no closer to being caught, the press turned their attention to the Metropolitan Police. Radical and Liberal papers alike accused the Home Secretary and Chief Commissioner of the Metropolitan Police of apathy, of putting little effort into the investigation and caring little about the victims, while the Liberal Pall Mall Gazette lamented the culpability of society, contending: ‘We are all at fault … and society stands helpless wringing its hands … not knowing the least in the world what to do or how to do it.’ The Tory press, however, defended the police and Home Secretary, instead calling for greater police presence in deprived areas such as Whitechapel. 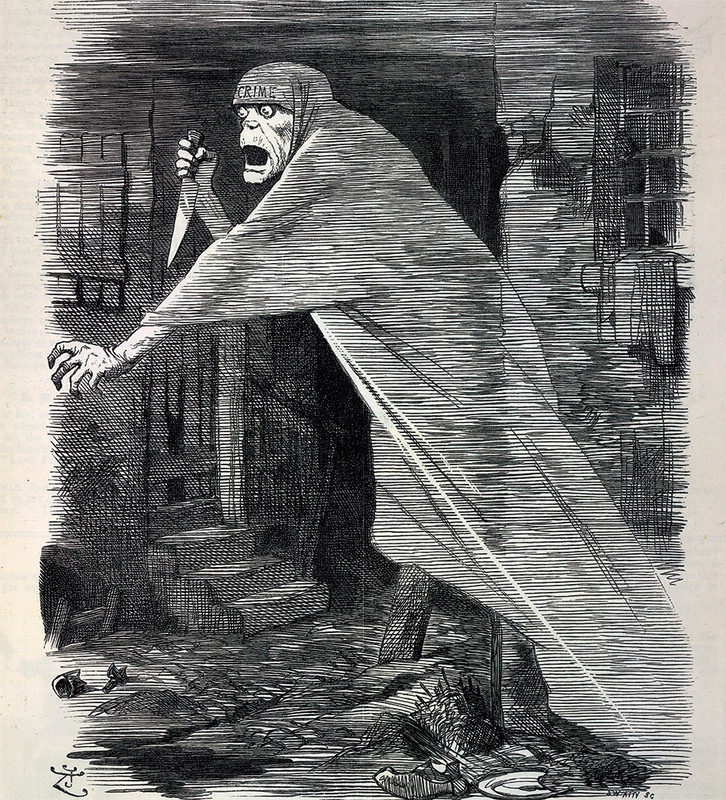 Indeed, the Conservative Punch produced a cartoon, ‘The Nemesis of Neglect’, in response to the murders, depicting the spectral figure of crime stalking the poverty-stricken areas of London. Newspaper coverage also distinguished between those who were more ‘respectable’ prostitutes – i.e. those who had turned to prostitution as a last resort – and those who led a life of general debauchery and drunkenness. When reporting on the inquest into the murder of Catherine Eddowes, the Telegraph tried to ascertain the morality of the victim, noting that although she was ‘drunk’ on the night of her murder, she nevertheless had ‘the character of having been a decent woman, doing work whenever she could get it’. The poor woman who had been foully done to death was by no means among the lowest of her fallen class. [Her partner] was employed about the fish and fruit markets, and when the work was plentiful the pair seemed to have paid their way honourably; but earnings were often irregular, and then it was feared that the woman resorted to the streets. The newspapers certainly appeared to take a more sympathetic turn when reporting on the murder of Kelly. Perhaps because she was only 25 and was the victim of a murder even more harrowing than the four before – her face and body had been butchered to such an extent that she could only be identified by her eyes – the reaction was more serious. Men and women struggled desperately to touch the coffin. Women with faces streaming with tears cried out ‘God forgive her!’ and every man’s head was bared in a token of sympathy. The sight was quite remarkable and the emotion natural and unconstrained. It seems that after a fifth brutal murder, sensationalism had run its course. But, 130 years later, ‘Jack the Ripper tours’ remain as popular as ever (the London Dungeon’s advertising campaign luridly exclaims ‘Will Jack the Ripper Strike Again?’), accompanied by books and TV shows. If anything, this tells us more about the power of the Victorian press in creating a sensational narrative that has survived to this day than it does about the events themselves. Had newspapers not drawn upon the theme of ‘outcast London’, questioned the morality of the victims and emphasised the gory details, it is possible that ‘Jack’ would not be part of British popular culture today. Beth Fisher is a postgraduate history student at the University of York.